With the expected opening of five new malls this year, and other commercial establishments next year, the organized supply of retail space in Qatar is forecast to exceed over 2 million square meters (sqm) by 2020, said a senior official of a leading real estate service provider, yesterday. These five new malls, which are estimated to be completed by the end of this year, include Doha Mall (Abu Hamour), Katara Mall (Al Qassar), Northgate Mall (North Doha), La Galleria (Msheireb) and Doha Souq (Al Mirqab), according to Q4 2018 Qatar market review released by DTZ/Cushman & Wakefield, yesterday. The organized retail supply in Qatar has increased by more than 100 percent since 2015 with the opening of 13 new malls in Doha, Al Khor and Al Wakhra. Total supply of gross leasable area within retail malls now tops 1.4 million sqm, of which almost 800,000 sqm is provided in the country’s five largest ‘super-regional’ malls. Outside of the main organized malls, outdoor destinations such as Medina Centrale and Porto Arabia on The Pearl, Qatar, Katara Cultural Village and Souq Waqif provide in excess of 200,000 sqm of leasable retail accommodation, which all comprise a high percentage of food and beverage outlets. “The additional supplies of residential units, retail commercial space and new hotel keys have along with other factors have resulted in downward pressure in the rents of properties and average room revenues in the hospitality sector, but the they are now stabilizing,” said Johnny Archer, Head of Consulting and Research, DTZ/Cushman & Wakefield, during his presentation. The report also noted that as a result of the economic downturn, real estate values have fallen by between 10 percent and 20 percent since 2015, depending on the asset category. A fall in residential rents has restored a sense of affordability to the market. In 2018 we have seen an increase in residential tenants ‘trading-up’; however, new demand will need to be stimulated to absorb the large amount of new supply that is due to complete in the next 24 months. The DTZ’s research team identified an increase in sales activity in the residential freehold market, as investors look to take advantage of the fall in real estate prices. In the residential market, the falling rents over the past 3 years have leveled off somewhat in recent months. 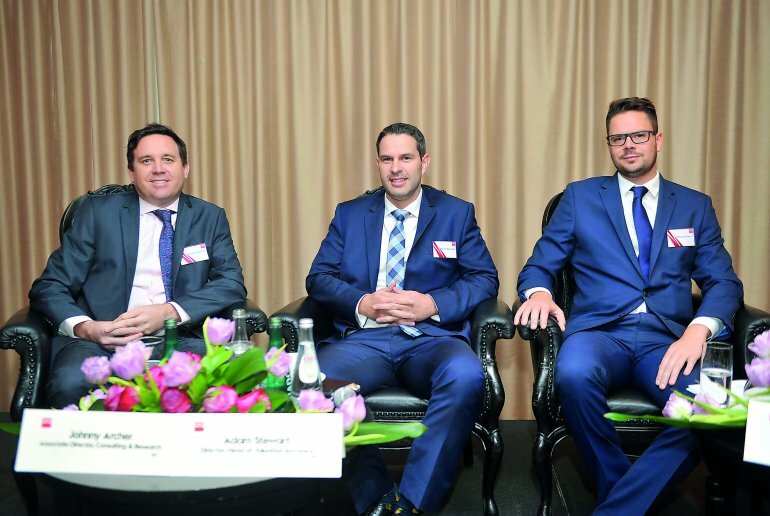 An overall fall in rents of between 15 percent and 20 percent since 2015 has restored a sense of value to the residential market, and DTZ have seen an increase in the number of residents ‘trading-up’ to take advantage of the reduced rents. In the commercial market, the development of new office buildings in Lusail has added to overall supply. This has resulted in rental levels falling by between 7 and 10 percent in the past year. Recent government initiatives to stimulate growth in the private sector, such as the introduction or Law No.1 of 2019, which relates to foreign ownership, are very welcome. While these measures are likely to benefit the SME sector and ‘startups’, it may take time to see a significant increase in absorption levels in the commercial office sector.